The birth of giant elliptical galaxies is a violent process, with most stars originating from incredible star-forming episodes and several galaxy mergers within large-scale structures (dubbed protoclusters). This formation process happened in the early epochs, when the Universe was only a few billion years old. Currently, researchers using the James Clerk Maxwell Telescope (JCMT) on Maunakea, Hawaiʻi are trying to locate the progenitors of elliptical galaxies, and thus protoclusters, using several observational techniques. Astronomers have recently discovered a handful of rare, enormous nebulae that copiously emit in the Hydrogen Lyman-alpha transition, a tracer of intergalactic gas. These emissions cover vast distances, up to 30 times larger than the Milky Way. Most of these Enormous Lyman-Alpha Nebulae (ELANe) host multiple active galactic nuclei and are surrounded by several Lyman-alpha emission galaxies. These ELANe are prime candidates for progenitors of elliptical galaxies and massive protoclusters in the early stages of assembly. While these regions are promising, researchers are now tasked with determining the presence of protoclusters and of heavy star formation associated with each ELAN. 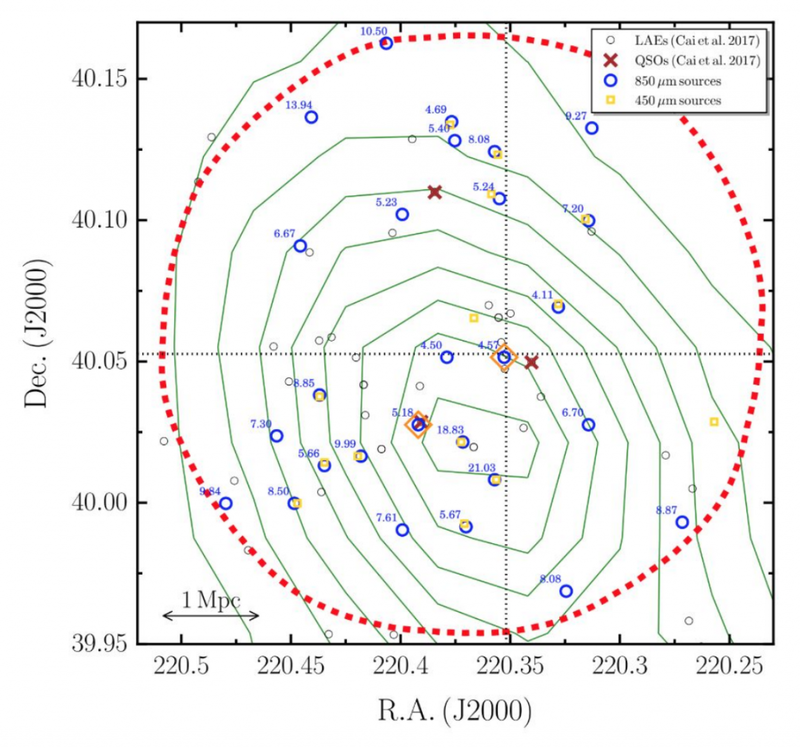 An international team of researchers started using the SCUBA-2 instrument on JCMT to characterize these protoclusters and the associated ELAN. Observing at 450 and 850 microns allows SCUBA-2 to capture the emission from dust powered by violent episodes of star formation, something that is not possible with optical telescopes. Results from the targeted ELAN MAMMOTH-1 field (Fig. 1) revealed the presence of a violent starburst galaxy and emission from a veiled active galactic nuclei (Fig. 2). These sources likely power the extended Lyman-alpha emission, and could be the progenitor of an elliptical galaxy. MAMMOTH-1 compared to other standard regions. This likely confirms the presence of a rich structure surrounding ELAN MAMMOTH-1, and hints at the presence of a protocluster, hosting the progenitor of an elliptical galaxy. 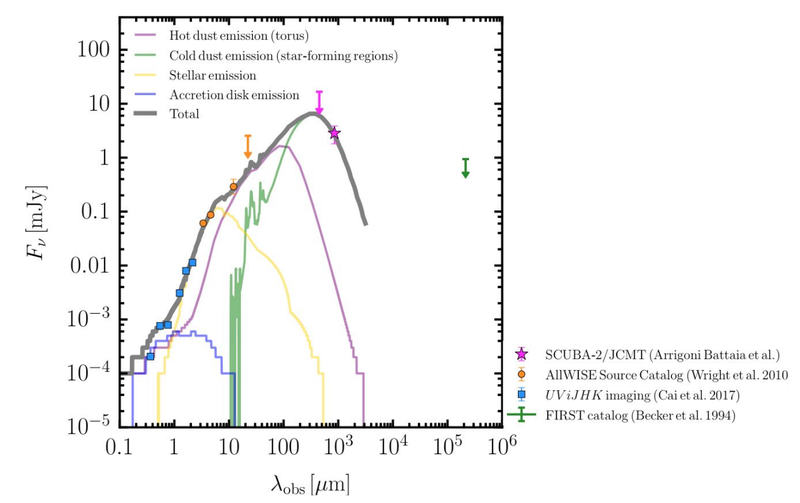 Figure 3 shows the distribution of Lyman-alpha emitting galaxies compared to the SCUBA-2 detections within the observed field. Hopefully, follow-up observations will confirm the relationship between these newly detected sources and a protocluster surrounding the ELAN. For now, these findings seem to agree with the expected theoretical characterizations of cosmic nurseries of giant elliptical galaxies. Figure 1: ELAN MAMMOTH-1 at z=2.3. This figure shows the surface brightness map (in units of erg/s/cm2/arcsec2) of the Hydrogen Lyman-alpha emission of the ELAN MAMMOTH-1 using a custom-made narrow-band filter. The map is color-coded following the level of surface brightness (see colorbar on the left). The nebula is clearly extended on intergalactic scales (hundreds of projected kiloparsecs; see yellow scale). The red star indicates the position of the likely powering source of this extended emission (see Figure 2). This figure was adapted from Cai et al. (2017). Image Credit: Arrigoni Battaia F., Cai Z. Figure 2: Spectral energy distribution for the source powering the ELAN MAMMOTH-1. The data-points are from Large Binocular Camera (Large Binocular Telescope) imaging and the Wide-field InfraRed Camera (United Kingdom Infrared Telescope) (Cai et al. 2017 and Xu et al. in prep. ; blue), AllWISE source catalog (Wright et al. 2010; orange), the SCUBA-2 (JCMT) observations (magenta), and the FIRST survey (Becker et al. 1994; green). 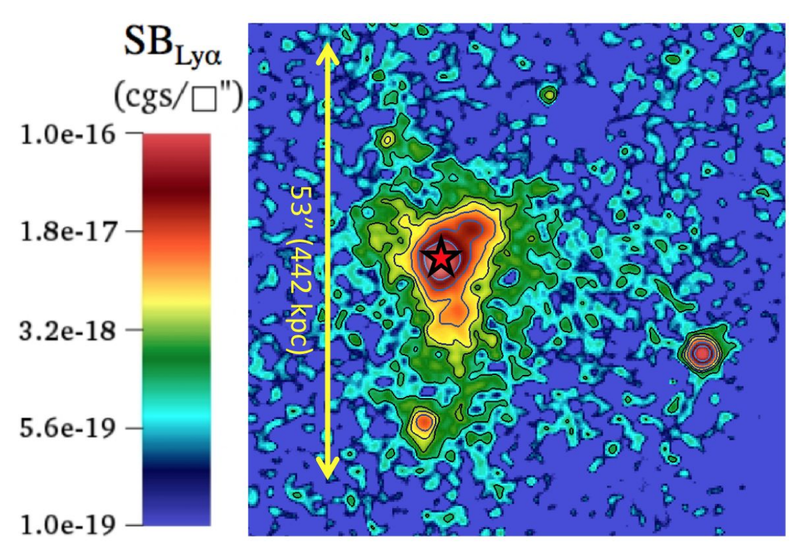 The SCUBA-2 data are key in constraining the spectral energy distribution of this source, allowing researchers to infer the presence of an obscured active galactic nucleus and of intense star formation of the order of 400 solar masses per year. Indeed, the grey line is the best fit model which includes a hot-dust emission component inherent of active galactic nuclei and a strong dust emission likely powered by intense star formation. This figure was adapted from Arrigoni Battaia et al. (2018) Image Credit: Arrigoni Battaia F./European Southern Observatory. Figure 3: Location of known sources surrounding the ELAN MAMMOTH-1. The small black circles indicate the known galaxies emitting Lyman-alpha emission within the known galaxy large-scale structure surrounding the ELAN MAMMOTH-1. The brown crosses indicate the quasars within such large-scale structure. The large blue circles and yellow squares indicate the sources detected within the two bands of the SCUBA-2 instrument, 850 and 450 microns respectively. The orange diamonds indicate the only two sources with both Lyman-alpha emission and SCUBA-2 detection. One of them is the ELAN MAMMOTH-1. The number of detected sources at 850 microns in the SCUBA-2 data reveals four times more dust-obscured sources than in “standard” regions, likely confirming the presence of a rich protocluster surrounding the ELAN MAMMOTH-1. The brightest of the SCUBA-2 detections coincide with the peak of the known galaxy distribution (traced by the green contours) within this large-scale structure (numbers close to each blue circle indicate the flux at 850 microns). This figure was adapted from Arrigoni Battaia et al. (2018) Image Credit: Arrigoni Battaia F./European Southern Observatory. The international authors of this paper are from European Southern Observatory, Germany, Durham University, UK, University of California, USA, Leiden University, Netherlands, Tsinghua University, China, and the Korea Astronomy and Space Science Institute, South Korea.